The first carrier strike group partially powered by biofuel was launched Wednesday. Known as the “Great Green Fleet”, US Navy’s warships, which are powered by alternative energy, have been sent to conduct operations in the Pacific. These ships that run partly on renewable fuel, are part of the Navy’s goal to go green and reduce its dependence on fossil fuels and foreign oil. The ships run on 10% biofuel and 90% petroleum. The biofuel used as part of the ships’ fuel is made out of beer fat. According to the Associated Press, it learned from Navy Secretary Ray Mabus that, initially, the Navy had aimed for a 50% biofuel and 50% petroleum ratio, but the cost proved to be too high. Mabus added that as competition in the alternative fuel industry grows, the cost may come down. The four warships powered by alternative fuels that were launched from San Diego, include the nuclear-powered aircraft carrier the USS John C. Stennis and the guided-missile destroyer the USS Stockdale. The ships have been deployed for seven months and are the first to begin regular operation with the biofuel and petroleum fuel mix. Other ships in the strike group and throughout the Navy will be receiving the alternative fuel blend throughout the next year. 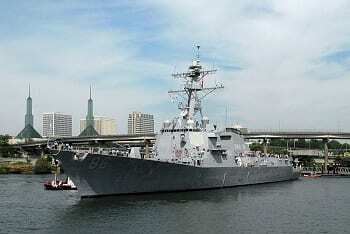 The U.S. Navy is working toward obtaining half of their power from alternative energy by 2020. Back in 2009, Mabus announced that, by 2020, the Navy and Marine Corps would obtain half of their power from sources that did not come from fossil fuels and that, by 2016, the Navy would deploy an entire carrier strike group utilizing biofuels. Since taking charge in 2009, the Navy Secretary has managed to cut the Navy’s oil consumption by 15% and the Marine Corps has reduced its use by 60%. Furthermore, since 2009, every class of ship in the Naval Vessel Register and every type of aircraft in the service’s hangers, has gone to sea or flown using various biofuels made out of beer fat, palm oil, municipal waste, camelina or algae. However, not everyone is on board with the Navy’s switch to biofuels. Some critics, including some Republicans and environmentalists, say that biofuel production is costly and if produced on a large scale may end up causing more harm than good, particularly if it takes a lot of fuel, fertilizer and farmland to produce. Mabus explained that turning to alternative energy will give the military options and give it greater control, so it’s no longer at the mercy of rising and falling oil prices or oil-producing nations that may not share U.S. interests.